It started out as a joke but then it became something very real, and might be close to cracking completely out of control. I'm talking about the famous "World Record Egg" of Instagram, an account which set out to get the most Instagram likes in history, and then promptly did so. 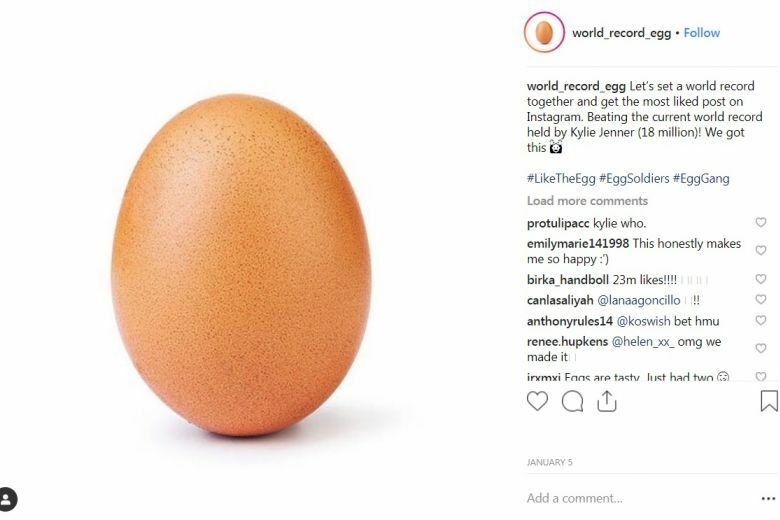 As of this writing, the egg's first post has more than 51.8 million Likes (handily beating out Kylie Jenner's previous record at 18 million when the post was made), and according to a recent story in The Atlantic it could make whoever is behind it millions of dollars. "Being the first brand to crack out of the egg is worth at least $10 million." Sharma goes on to say that he would advise clients with that kind of money to spend to do so "on the egg instead of the Super Bowl," strong words given the latter's status as, well, the Super Bowl of advertising. Success like this brings a wave of imitators and hangers-on, and the World Record Egg has had to deal with more than its fair share. Instagram star Supreme Patty was incorrectly identified in the press as the creator of the account, and a marketer named Ishan Goel also claimed to have played a part in its success. But the egg denied both claims in an Instagram Direct Message. But the egg does appear to have a connection with Jerry Media, which also happens to be the company behind the infamous Fyre Festival disaster. Jerry Media has reportedly been working with the egg in "an unofficial capacity" and earlier this month the company approached a non-profit organization called Need to Impeach with a proposal that an animated President Trump could be the one to pop out of the egg along with the text "Impeach Trump." The organization passed, and Jerry Media's CEO Mick Purzycki says that the idea was based on "noncommercial" motivations, rather than to turn a profit. Whoever is behind the egg would seem to be interested in noncommercial motivations too. The account has already sold merchandise like t-shirts bearing the egg's image, with a portion of the proceeds going to benefit charitable organizations like National Alliance on Mental Illness and the Campaign Against Living Miserably. That being said, whoever does pop out of the World Record Egg, if and when the hatching occurs, will more than likely pay big bucks for the privilege. Stay tuned.